Where is Silver Meadows and why do people like to live here? 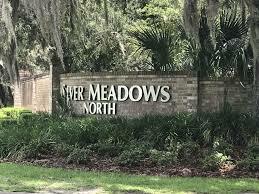 Silver Meadows is a large gated community in NE Ocala actually located in Silver Springs. The Neighborhood features a community tennis court and basketball court. Take an evening walk down the lit streets and look for wildlife that may have wondered in from the near by state land. This fantastic neighborhood is divided up into 3 areas: North, South, and Central. Each section has a separate gate but once inside, there is no delineation between the areas. There is typically plenty for sale in here just due to the size of the neighborhood. The location is a few minutes drive to shopping or restaurants but nothing in walking distance for sure. If you are a nature lover, the neighborhood is adjacent to state land and minutes to Silver Springs State Park. I want to sell my home in Silver Meadows. If you are considering selling or wish to know your homes market value, please contact me click here for a free market analysis. Then call me and let’s get it SOLD! I want to look at homes here or buy a home here. I am very happy to help you with that process. Please see list of home available below and let me know if you have any questions or wish to take a look. 4 bedroom 3.5 bath 2 story home with 2 car garage in the gated community of Silver Meadows. Home Is 2947 sqft and is postioned on 1.5 acre corner lot with a culdesac. Solid wood cabinets and granite counter tops accent a spacious kitchen. Wood and tile floors in common areas and carpet in bedrooms. Large bay windows on both the front and the back of the home. Private back yard features a covered patio with attached pergola and a stone pavers. HOA fees only $300 / year.